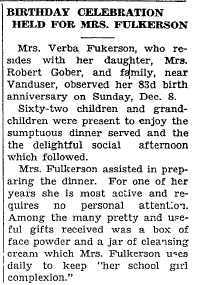 Mrs. Verba Fulkerson, who resides with her daughter, Mrs. Robert Gober, and family, near Vanduser, observed her 83d birth anniversary on Sunday, Dec. 8. Sixty-two children and grandchildren were present to enjoy the sumptuous dinner served and the the delightful social afternoon which followed. 1) I like the phrase, 'birth anniversary.' It should be used more often. 2) Most of my great great grandparents didn't have that many offspring. I may try to see how many of Verba's descendants we can identify when the 1940 census is released next year. 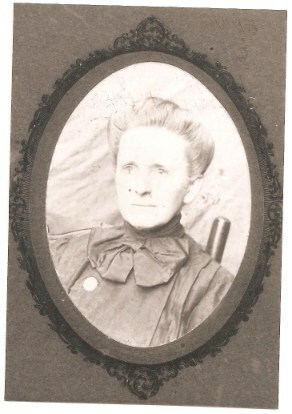 3) The photograph of Verba to the left was found in a Public Member Tree at Ancestry.com, and comes from the collection of Alix Reichert, who blogs at Hard Act to Follow. It is shared with Alix's permission.